Miss Celie is based on the character Whoopi Goldberg played in "The Color Purple". This bear was created for the "Tinsel Town Teddies" auction sponsored by Warner Brother Studios in 1996. It was signed by myself and Whoopi Goldberg. 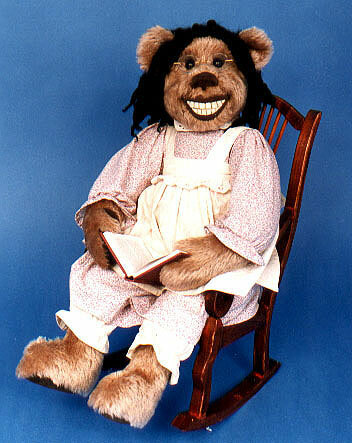 Whoopi held this bear hostage until a promise was made to make a similar bear for her on commission. The promise was fulfilled and the bear pictured was purchased by the Teddy Bear Museum of Japan.